Quinoa Nutrition: What Does it Do For You? Quinoa Nutrition: What's in it For You? Quinoa nutrition is making a huge splash on the nutrition scene, and most people have at least heard of it, if not tasted it and grown to love it. Quinoa is my go-to whole grain, probably because it cooks quickly, stores in the fridge well, and it can be eaten completely plain or take on any flavor I want. Plus, I love the slightly crunchy and soft texture of each individual grain. Quinoa is like Nerds for adults. So Exactly What is Quinoa? I know you're wondering and don't want to sound ridiculous, so when you ask the cashier where to find it in the grocery store, pronounce it "keen-wah." They'll know exactly what you mean and point you in the right direction. Quinoa is actually a seed related to spinach, but it poses and substitutes well as a whole grain, and it cooks just like a grain. What is the Quinoa Nutrition Count? The big deal behind quinoa nutrition for vegans is that it is a complete protein, meaning it supplies all the essential amino acids in one bite. One of the knocks people try to give to veganism is that plant foods aren't complete proteins like you find in abundance in meat, eggs, and dairy products. While this is true, a) there are a few plant foods that have all the amino acids, and b) you don't need to eat only foods with complete proteins as long as you eat a wide variety of different whole grains, beans, vegetables, fruits, nuts, and seeds. 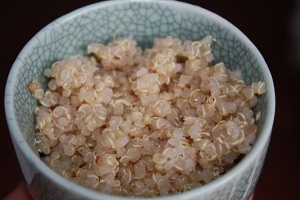 One of the most prominent amino acids in quinoa nutrition is lysine, which helps your body to repair broken tissue and can be especially helpful if you're prone to cold sores or canker sores. In an interesting twist, quinoa seems to help people with migraine headaches, perhaps because of the high levels of folate, manganese, and magnesium, which will help to relieve pressure on your blood vessels. When your blood vessels are relaxed, it also prevents plaque from building up in your arteries, which helps your entire cardiovascular system and can prevent heart disease. Another benefit of quinoa nutrition in your heart health is that one of its primary phytonutrients is lignans, which protects our heart and helps to prevent cancer. Another cool thing about whole grains in general and quinoa in particular is that it can help to reverse diabetes. The magnesium in quinoa helps to reduce the risk for developing diabetes. 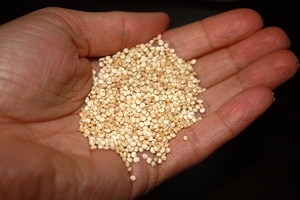 If you already have it, eating whole grains like quinoa helps to loweru insulin resistance. All in all, you should try to eat three servings of whole grains each day to get the diabetes protection from quinoa nutrition. As with most whole grains and whole vegan foods, the fiber in quinoa nutrition helps to lower LDL and total cholesterol levels and regulates blood pressure, regulates your digestive system, and helps maintain weight levels. Quinoa cooks a lot like rice or couscous. It needs to be rinsed to remove the natural saponins from the grain. As you rinse you'll see what looks like soapy bubbles running out. Once the water runs clear, you're good to go. To cook quinoa, bring water to a boil, stir in the quinoa, bring it back to a boil, lower the heat to low and cover until the water is absorbed. 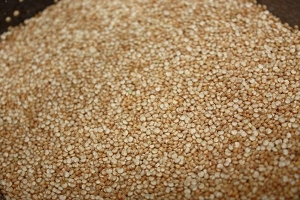 You should use 2 parts water to 1 part quinoa, so if you want to feed four people, aim for 2 cups water and 1 cup quinoa. Using this technique to cook quinoa makes it simple to multiple for larger groups or divide for just one. I find it freeing to know that I don't really need a recipe. If I only have one mug in my possession, I can fill that mug with water twice, bring that water to a boil, and then refill the mug with quinoa and add that into the boiling water. Even a few years ago, quinoa was a specialty item that you could only find at select health food stores, but now it's made a grand entrance onto the grocery scene and you can truly find it in just about all grocery stores. If you live in a really small town, you might want to look to the internet for help and find a way to buy it in bulk. Otherwise, everywhere you go, you can find this cute little grain.